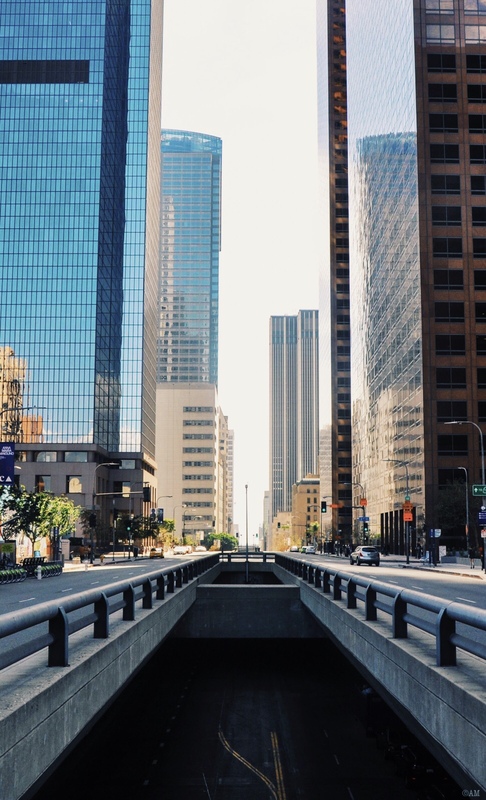 Downtown LA — Travel, Eat, Repeat. Los Angeles is a city with a million things to do. I've spent quite a bit of time exploring Downtown LA, so I want to share some of my favorite spots with you. The good news: all of these places are within a thirty minute walk! Impromptu photoshoot at Walt Disney Concert Hall's Garden with my gorgeous friend Ashley. This iconic building was at the top of my to-see list. Designed by Frank Gehry, this building is one of the most eye-catching ones you'll stumble upon in LA. (Gehry will be starting a new project in LA pretty soon, designing another building that will be located on Sunset Boulevard.) The silvery plated walls of the building are definitely unanticipated, but they serve as an interesting backdrop for photos. What some people may not know is that this building originally had extremely reflective mirror-like walls, reminiscent of the Bean in Chicago. However, reflecting sun rays would temporarily blind drivers on the street, so they changed the material. If you are curious to see what it looked like before the renovation, you can still find an untouched portion in the "Garden." Also, when walking through the Garden, don't forget to look up for some sick views! Before (right) and after (left) the wall renovation. Located next to the Walt Disney Concert Hall is The Broad. I'm sure most of you have seen people take selfies in the extremely popular Infinity Room exhibit, but there is more to the museum. (You can bet I would have certainly included a photo of myself in that room if it weren't for the 3 hour wait). The art here is contemporary, colorful, and fun...that being said from an anything-else-but-a-museum type person. On the off chance it rains in LA, or you are a museum fanatic, this is a place you'd want to check out! The multi-colored crosswalk by the Venezuelan artist, Carlos Cruz-Diez, outside The Broad. Those [symmetric] columns on both the left and the right are elevator shafts. A historic building with a beautifully skylit interior makes it a popular spot for people to come photograph. It's one of the oldest buildings in LA, and the ironwork designs are so intricate, it makes it unlike any other building I've visited. You may recognize it from being featured in the movie, Blade Runner. It's lit: a fun light mural in Grand Central Market. Next stop, foooood. There's something to say about the bustling atmosphere of a food market. LA is a foodie city forsure, so if you're wandering through Downtown, Grand Central Market is the move. The convenient location offers a plethora of different cuisines – from Salvadorian, to Filipino, to Eggslut, you're sure to find something you like. Pork ribs from Sari Sari in Grand Central Market. Sari Sari translates to "variety" in Tagalog. Appropriately named since there's so many options to choose from, and WHATEVER you decide to order here is delicious! Feeling luxurious? Spire 73 is America's tallest open-air bar. This sleek rooftop cocktail lounge has a chill and relaxed vibe (think date spot). Drinks will be expensive... no surprise since it is a rooftop bar in a major US city. Go on a weekday, and you can avoid the painful $25 cover! Sip your drink in a cozy cabana, next to a fire pit, or on a grassy bench (you'll see what I mean if you go), there's plenty of seating options. Look out over the city and you'll be feeling bad and boujee. This venue is one of my favorite places when it comes to going out. Clifton's has solid music, a fun crowd, unexpected performances, and sometimes even theme nights. Imagine a setting that looks as if it's a cross between a Rainforest Cafe, the American Museum of Natural History, and Disney's Haunted Mansion. Google it (better yet, actually go there! ), then you'll understand. There's even a room that makes you feel like you've traveled back in time – swing music, a grand piano, and other knickknacks placed throughout the room. Not feeling the vibe in any of those rooms? Get a Mai Tai at the secret tiki bar on the fourth floor. Pro tip: at the end of the night, buy one of the hot dogs from the street vendors outside. A building in the financial district of Downtown LA. For any die-hard Entourage fans out there, this spot is featured in an episode–in Vince's movie trailer for "Hyde." Just walking around Downtown LA will be a good day in itself. There's so many great areas to explore, plus it's filled with color and it's a lively city. Do you have any recommendations you think should be added to this list? Let me know what you think so I can check them out next time I'm there!